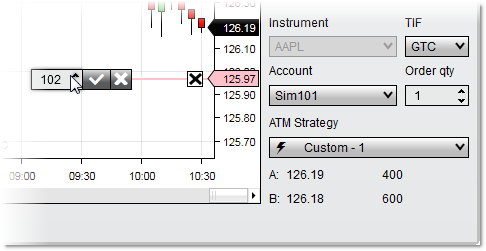 An order can be modified or canceled within a chart when Chart Trader is enabled. To modify the price of an order, left mouse click on the label at the left side of the order line. A ghost order line will appear and display the number of ticks you are away from the inside market. When the ghost order line is above the Ask price, the label will display a positive value. When it is below the Bid price, the label will display a negative value. At the Ask the label will display "@Ask," and at the Bid the label will display "@Bid." Once you have the ghost order at the price you desire, left click with your mouse to complete the modification. This is a click and click method, rather than a click and drag method. To cancel a pending order price modification, press the "Esc" key on your keyboard. Left mouse click on the area of the order label that displays the order quantity. An order size modification control will appear. Modify the quantity in the quantity field by using either the up/down arrows, the mouse scroll wheel, or by typing the desired quantity. When done, click the check mark to accept the modification, or press the X to cancel the modification. 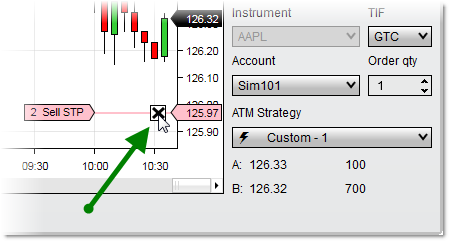 To cancel an order, left mouse click on the red X on the order marker. Remember that if you cancel an order that is part of an OCO group, any other orders in that group will be canceled, as well. 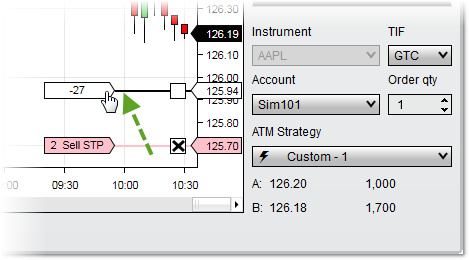 For more information on using OCO orders with Chart Trader, see the "Understanding 'One Cancels Other' (OCO) Orders" section of the Submitting Orders page.